At 111, Alexander Imich has been officially verified as the oldest man in America and the second oldest in the world. A resident of Manhattan who lives on the Upper West Side, he had the honor of being congratulated by the New York State Senate last year, on his 110th birthday. 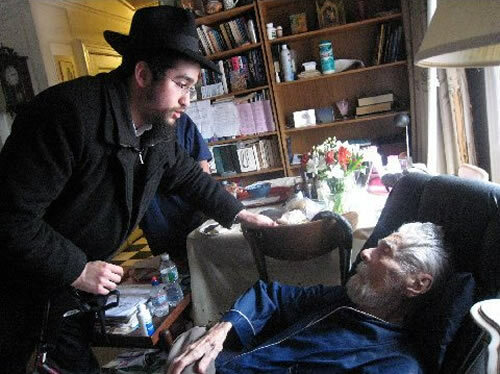 But recently, he received some more attention, as well as some unexpected help—putting on tefillin for the first time in almost 100 years, getting a mezuzah for his apartment door, receiving replacements for the much-needed hearing aids he had lost, and having round-the-clock home attendants to help care for him and new people to keep him company. All of this was the result of a recent hospital visit by Rabbi Pinny Marozov, co-director of Chabad of Coney Island in Brooklyn, N.Y., with his wife, Chaya. The 30-year-old rabbi found out about Imich while in Seattle seeing family. A Shabbat guest suggested that he pay the elderly man a visit, though neither of them realized at the time quite how old he was, recalled Marozov. On his return to New York, Marozov dropped in on Imich, who was in Roosevelt Hospital being treated for a fall in his apartment. 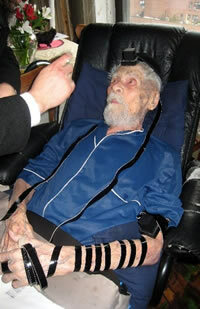 Imich celebrated his 111th birthday there, on Feb. 4. He had lost both of his hearing aids at the hospital, which made communicating difficult; nevertheless, the two men connected. He also helped Imich wrap tefillin. Marozov said he didn’t think Imich had put on tefillin since his Bar Mitzvah—nearly 100 years ago—in Czestochowa, Poland. The rabbi returned for another visit once Imich was back home. 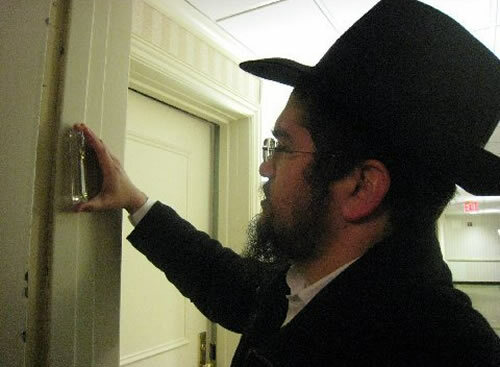 While there, Marozov helped Imich put on tefillin once again and also affixed a mezuzah to the door leading into Imich’s apartment, where he has lived—these days, alone—since 1965. “He was very happy to see me,” said Marozov, adding that Imich was alert, and able to see and walk on his own. “It didn’t seem like a rabbi had ever visited him in his home or made any contact before. I know it meant a lot to him,” said the rabbi. The rabbi said the older man simply lit up when the tefillin was wrapped and the mezuzah hung. Other sparks ignited from there. On that visit, Marozov invited Beth Sarafraz—a reporter from The Jewish Press, based in Brooklyn—to come along with him, and a full story on Imich was printed in the Feb. 28 edition. It got tremendous feedback. Readers learned of his situation and hastened to help: two days later, Imich had replacement hearing aids, home attendants to support his recovery and many new visitors. Born in Poland in 1903, Imich underwent his schooling there, including earning a Ph.D. in 1927. He survived two World Wars, the Holocaust and two years in a Russian labor camp near the White Sea, before leaving for the United States and starting a new life there with his wife, Wela. She passed away in 1986. Imich spent his career as a chemist, ultimately trying to prove to other scientists that the neshama (soul) survives physical death. In 1995, at the age of 92, he edited and published a book called Incredible Tales of the Paranormal. At this point, he said, he has outlived all of his peers. He and his wife had no children, and most of his family members perished in Nazi concentration camps. Imich and his wife survived because they were deported to a Russian labor camp instead of Auschwitz. Marozov and his wife are both from Montreal. They have been on shlichus in Coney Island for about a year-and-a-half, and just welcomed their first baby, a girl. His sister and brother-in-law, Rivkah and Rabbi Chaim Brikman, serve as co-directors of Chabad of Sea Gate—a private gated community at the far western end of Coney Island, at the southwestern tip of Brooklyn—and helped bring the couple there. Marozov said he plans to visit Imich again before Passover and bring him some shmurah matzah—round handmade matzah made from grain that is guarded from the moment of harvesting, so that no fermentation occurs. Nice story, we need more good in the world. One thing I'd like to say is so many people are so quick to say negative things about Chabad. I'm not Lubavitch & don't plan on joining. I just wish the negative people would stop & think for a minute. When stories like this come out, 95% of the time, whose involved? Chabad! When you find yourself in a city with a small Jewish community & there's one small restaurant to eat at, who's supervising it? Chabad! When your traveling & get to the hotel you booked late at night & find its a run down, fleabag hotel in a seedy part of town, who do you call? Chabad! When your car breaks down or whatever & it's an hour before Shabbos, who do you call? Chabad!